New York City is one of the most visited cities in the world and few tourists visit without a trip to Times Square so any long-term transformation of the space has the potential to boost tourism to unprecedented heights. Imagine what it would look like if every blinking blaring ad in Times Square was replaced with a piece of art for an entire month every year. Would foreign tourists plan trips to see the larger than life art exhibit? Would New Yorkers plan routes through Times Square rather than away from it? Times Square Art Square’s Kickstarter project is one step towards accomplishing its goal of turning ads to art in Times Square. Photo by Emily Stanchfield. Times Square Art Square wants to find out. The organization, headed by Justus Bruns and Angela Moschetta, is slowly working towards that goal with the launch of a $100,000 Kickstarter project. If successful, the money will be used to execute a multi-day proof of concept event in 2013 that would feature Rafaël Rozendaal‘s art to give stakeholders and the city a taste of the month-long exhibition. Introducing art to Times Square isn’t a new idea. The Times Square Alliance switches ads to art from 11:57 pm to midnight every night and rotates the exhibits on a monthly basis. 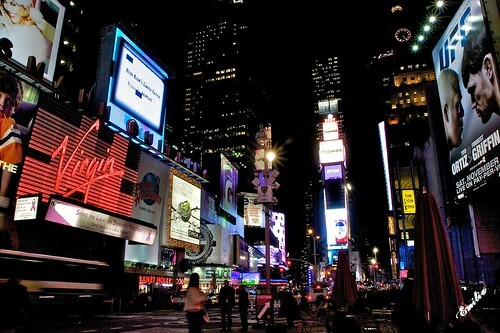 See.Me launched a global competition for artists and displayed the winner’s work on a Times Square billboard. What sets the month-long exhibit apart is its potential to draw domestic and foreign tourists to the city. The Christo Gates project in Central Park in 2005 attracted over 4 million visitors and brought $254 million to New York City’s economy in just two weeks. Times Square Art Square used those numbers to estimate that its project could bring over $124 million to the city’s economy by its third year. Similar projects includes the privately funded High Line Park, which has become a key tourist attraction for tourists and New Yorkers, and Kickstarter projects that exceeded fundraising goals to transform an underground trolley terminal into an underground park and create a floating pool in the East River. The team behind Times Square Art Square aims to host the month-long exhibit for the first time in 2014 but readily admits that it will take an entire movement and key partnerships to turn their dream into a reality. “The city reinvents itself every few generations and it’s ripe for a change,” says Moschetta.